It's official, Pope Benedict XVI declared Blessed Pedro Calungsod as a new saint Sunday, October 21 at Vatican City. Saint Pedro Calungsod, lay cathechist and martyr is the patron of the youth according to the pope. Calungsod is the second Filipino that received canonization after San Lorenzo Ruiz of Binondo Manila who was canonized October 8, 1987 in Vatican City, Rome by Pope John Paul II. To be qualified for the sainthood, Holy See approved first the miraculous deeds of Calungsod. The recognized miracle dates from 2002, when a Leyte woman who was pronounced clinically dead by accredited physicians two hours after a heart attack was revived when a doctor prayed for Calungsod's intercession. Pope Benedict XVI approved and signed the official promulgation decrees recognising the miracles as authentic and worthy of belief. 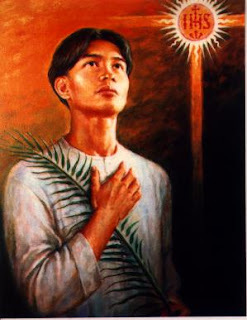 Calungsod (known also as Pedro Calonsor was born on 1654 at Visayas region and died April 2, 1672 due to missionary work at Ladrones Islands in the western North Pacific Ocean (Guam). He is a young Catholic sacristan that time accompanied by Blessed Diego Luis de San Vitores with mission to preach Christianity to the Chamorro people through catechism, while baptizing both infants, children and adults at the risk and expense of being persecuted and eventually murdered. At the young age, Calungsod became a model of purity and faithfullness for the youth. Last March 5, 2000, Blessed Pope John Paul II beatified the martyr saint. On February 18, 2012, it was announced by Pope Benedict XVI the date of canonization. Simultaneous events were conducted by Filipinos to celebrate canonization. In Manila, the Archdiocese gathered youths at the Santo Niño de Tondo Parish for a program on the canonization from 2:30 to 7 p.m. It was followed by an 8 p.m. Mass. In San Juan City, another group organized an event titled “San Pedro 10.21” at the San Juan Arena from 1:30 p.m. to 6 p.m.
Jose Rene Almendras, Philippine Secretary of Energy and Vice President Jemomar Binay became spokesperson of President Aquino at the canonization. Pnoy is not available for the event due to pledged state visit at New Zealand and Australia.